Posted Saturday, March 24, 12:00 p.m. The March For Our Lives is well underway. We’re on the ground with students with Stoneman Douglas who are joined by hundreds of thousands of people. The estimate for the crowd was 500,000 but at this point it looks like more than that. I’ve interviewed several students here so far. Corinne Small is a Senior at Douglas. She marches for the 17. Two of her classmates were killed, Meadow Pollack and Helena Ramsay. “No child should ever be afraid of going to school,” she said. Kayla Schaefer is a junior at Douglas. “We just need to make sure schools are safe,” she said. 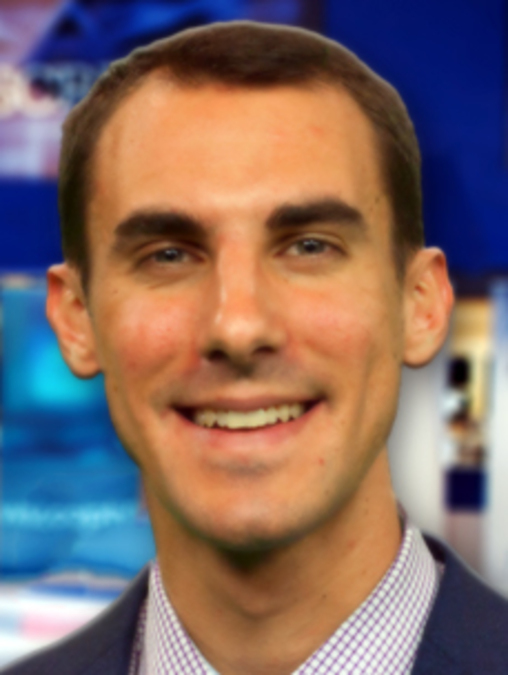 Keep following me on twitter @AlexHagan_WPTV and this blog for more updates. Corinne Small is a Senior at Marjory Stoneman Douglas High School. 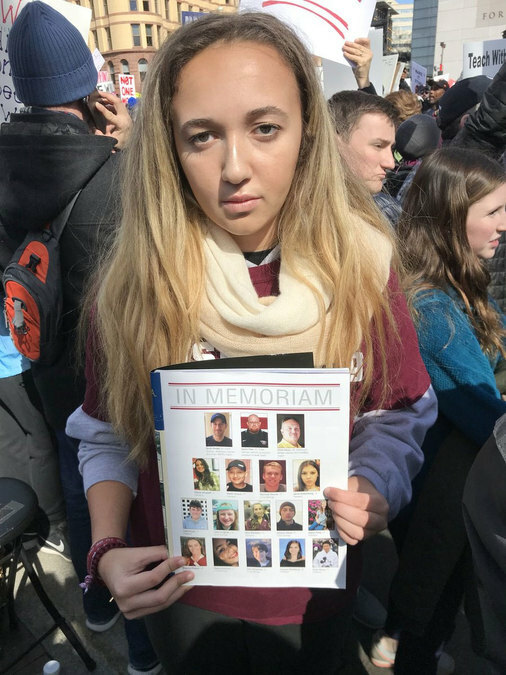 Kayla Schaefer is a Senior at Marjory Stoneman Douglas High School. Posted Saturday, March 24, 9:30 a.m. Hundreds of students, parents and teachers gathering at the JW Marriott hotel in Washington D.C. this morning. This is right next to Pennsylvania Avenue where the march will take place. Students are putting their finishing touches on their signs. 500,000 people will be joining them for the March. They’re calling for change when it comes to stricter gun control measures, mental health, and school security. It’s been a long journey for them even though its been only a little more than a month since the MSD high school shooting. 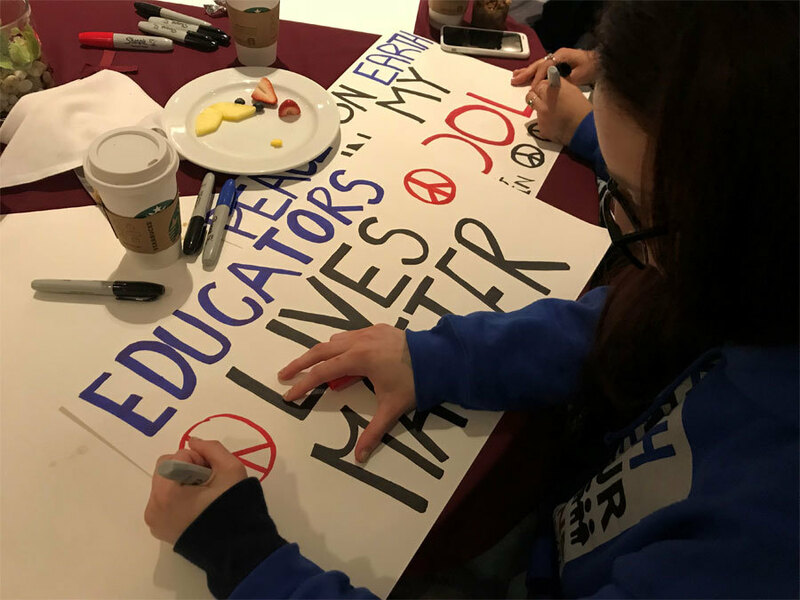 They’re ready to take the streets of D.C.
Demonstrators prepare signs for the March for Our Lives in Washington D.C.
Posted Saturday, March 24, 7:30 a.m.
Good morning from Washington, DC. It’s a chilly day here! Students from Marjory Stoneman Douglas are waking up now. They were busy making signs all night with different messages. So I’m told students will meet at the J.W. Marriot on Pennsylvania Ave. They plan to start marching towards the Capitol around 10am. The March goes from noon until 3pm. and it could be more! There is so much support for these students. Posted Friday, March 23, 8:30 p.m. Caught up with Alexander Goodchild again. This time in Washington, D.C. He traveled with his parents this morning. Alexander is in band and lost three of his friends February 14. When I met him for an interview, he was in shock when he learned that 500,000 people were likely to come to DC for the march Saturday. He says it’s moments like this that give him confidence that there will be a change with this movement. Alexander is spending the night in Arlington making signs with his girlfriend tonight who is also a student at MSD. 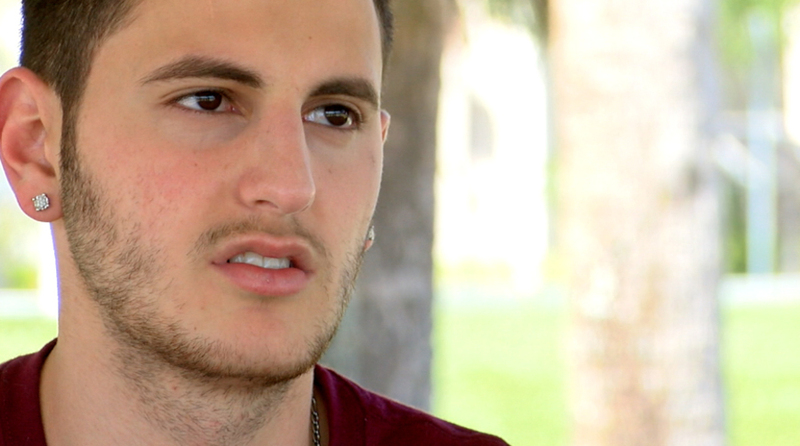 This is the second time I’ve interviewed Alexander in the past week. Such an intelligent, articulate young man with a lot of passion. He plans to attend USF in the fall and continue his love of playing the saxophone. “All the support here, It’s phenomenal. I can’t wait to see what’s going to happen soon." Posted Friday, March 23, 4:30 p.m.
Craig Pugatch, Marjory Stoneman Douglas alum. 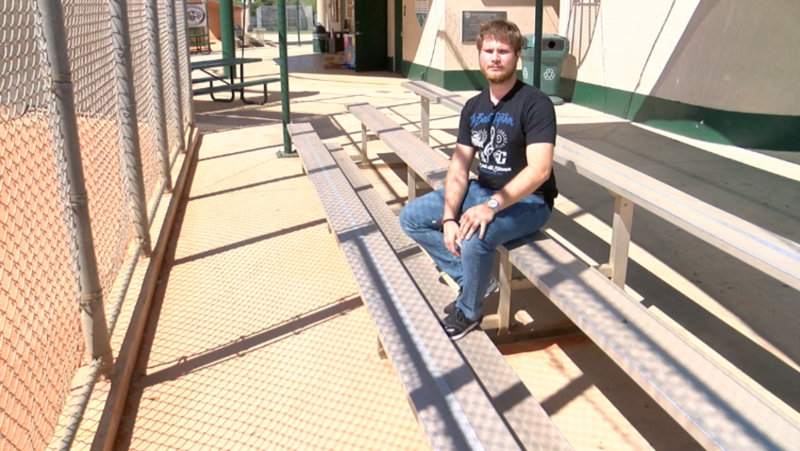 Craig Pugatch is an MSD alum living in Lighthouse Point. I met up with him here in Washington to talk about his quest to raise money to get as many people as possible here. He is the national coordinator for mobilizing MSD alumni. He says his group raised more than a hundred thousand dollars to pay for bus loads of people to come up here to the city. You could say his efforts are part of the reason the crowd here will likely be in the hundreds of thousands possibly even a million. 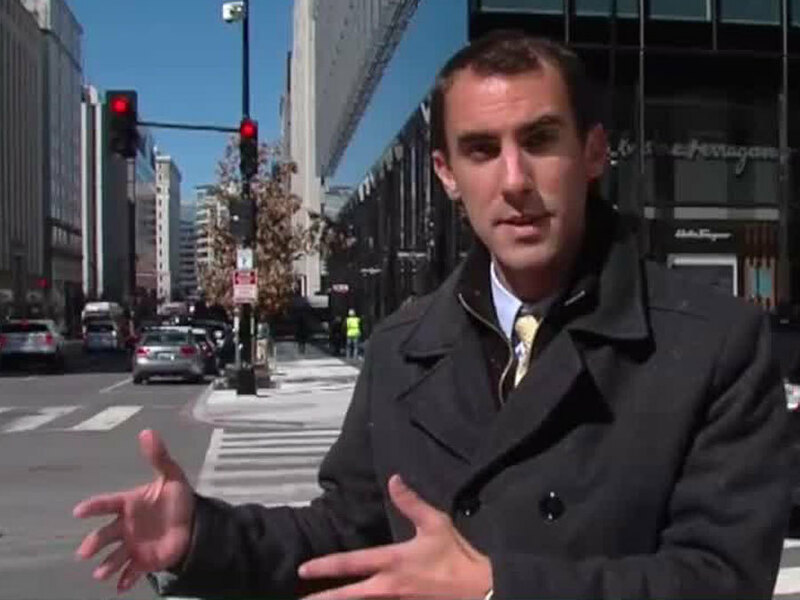 Posted Friday, March 23, 11:55 a.m.
Alex Hagan arrives in downtown D.C.
Made it to downtown. We plan to meet with some students and parents this afternoon. Some are going to explore the city and the museums on the National Mall. Others have been meeting with congressmen. Zach Hibshman, a junior at MSD tweeted a video of students meeting with former Vice President Joe Biden. Many preparations underway as Pennsylvania Avenune is set to shut down for the march tomorrow. Keep following this blog as I meet with students and see what they’re up to today. 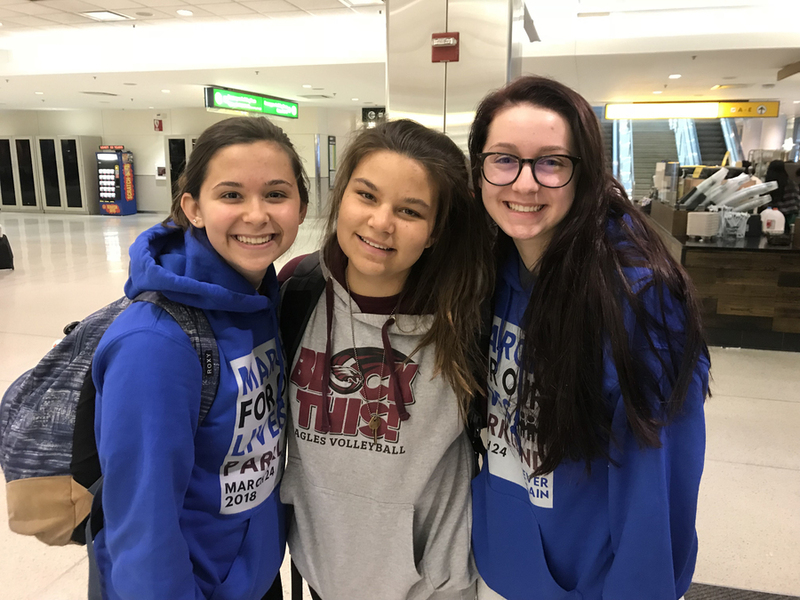 Posted Friday, March 23, 10:20 a.m.
Stoneman Douglas students begin to arrive in D.C.
Marjory Stoneman Douglas students Julia Salomone (from left), Lindsey Salomone, and Remi Work arrive in Washington, D.C., on Friday. I just landed at BWI near Washington, D.C. On board the plane were several students from Stoneman Douglas, including Lindsey Salomone, a freshman, her sister Julia, and their friend Remi. They’ll be exploring D.C. today and we’ll catch up with them later. Lindsey’s name may sound familiar as she was interviewed by our very own Michael Williams after the Parkland shooting. She was in building 12 at the time of the shooting. A week later she traveled to Tallahassee to speak with state leaders, representing many of her friends who could not go. Her message is that change needs to be made, not only as her community comes together, but the whole world. She says what happened at her school should never happen and politicians need to know that. 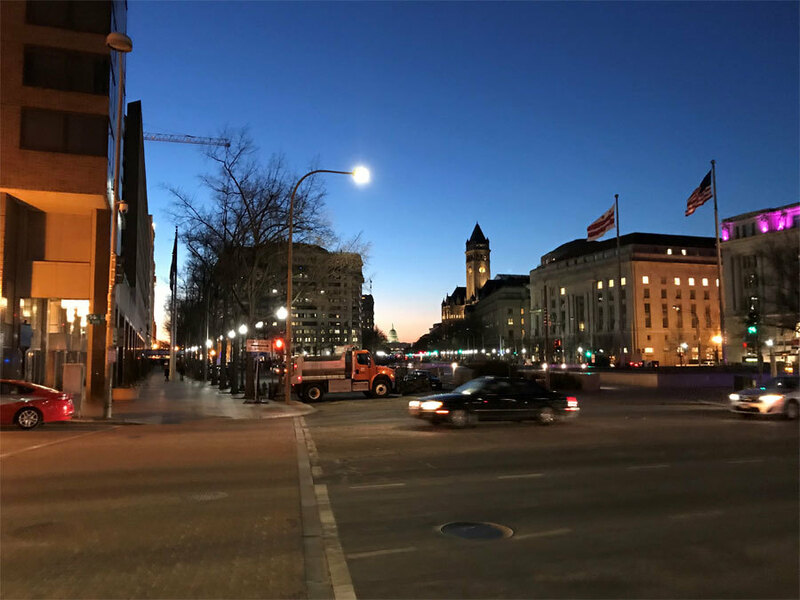 Posted Thursday, March 22, 3:15 p.m.
Thousands of people are expected in Washington, D.C., this weekend for the March for Our Lives. I’ve been posting about students and teachers at Stoneman Douglas heading north. There are also a number of people from Palm Beach County going to Washington as well. That includes Wellington mom Pola LoBello. Pola reached out to me about her own movement in the wake of Parkland earlier this week. She started MADStrong or Mom’s and Dad’s Strong Movement. Her movement demands action on mental health reform, secured schools, stricter gun laws, similar demands to the students at Stoneman Douglas. She says she is proud of the students who have raised their voices and is a mom who will support them in their fight to keep kids safe. 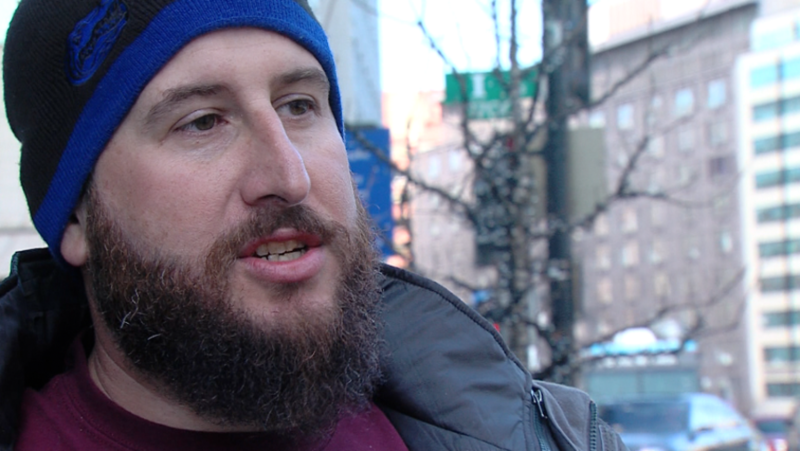 Pola will get on a bus with her son Anthony LoBello along with a number of families Friday for the march in D.C.
Posted Thursday, March 22, 10:30 a.m. I'm putting together some pieces today before I head to DC. Right now students, parents, and teachers not just from Parkland, but all over the country are heading to Washington. Jeff Foster is an AP Government teacher at MSD. Many of his students are part of the Never Again Movement. Right now he is driving to our nation’s capital to stand with his students for the March for our Lives. 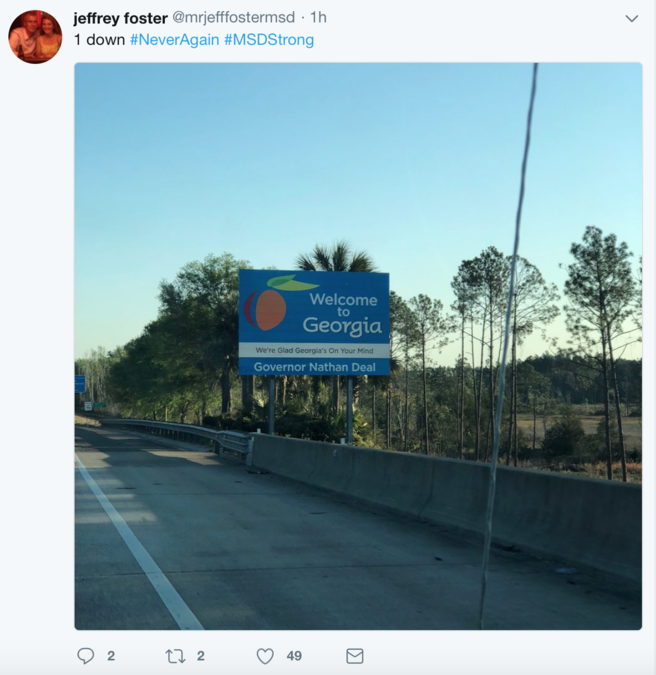 He tweeted a photo not to long ago of him crossing the border into Georgia. Posted Wednesday, March 21, 5 p.m.
Alexander Goodchild is a senior at MSD. He lost three of his friends on February 14th. Two of them were in band with him, Gina Montalto and Alex Schachter. This Saturday he will be in Washington to march for them. He hopes his message brings change. Here’s an excerpt from his interview with me today: “There has to be something that we can do, if not change legislation, change social views, change something to allow this not to happen again. 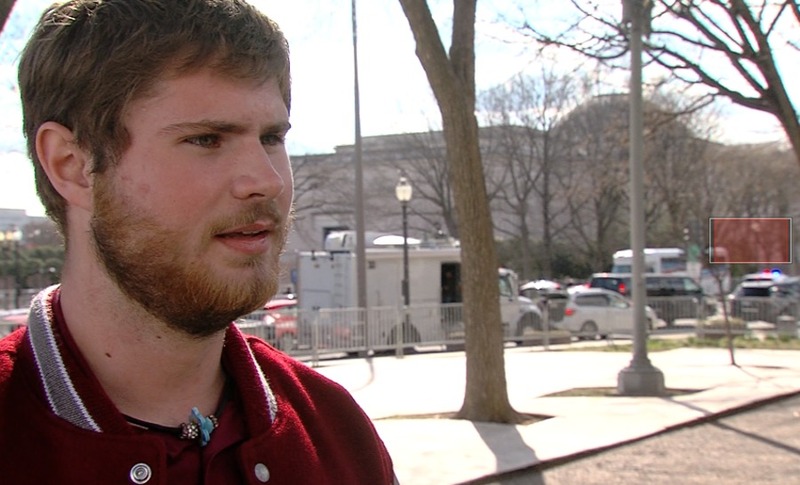 Posted Wednesday, March 21, 2:30 p.m.
Marjory Stoneman Douglas senior Noah Damiani is heading to Washington for the March for Our Lives. I am down in Parkland for the day and spoke with MSD Senior Noah Damiani. He is leaving for Washington, D.C., Thursday evening. On Friday he plans to meet with Congress to discuss gun reform. He wrote a letter to them about the need for change. He then plans to march with his fellow students Saturday. On February 14, seventeen people lost their lives in the tragic shooting at Marjory Stoneman Douglas High School. Immediately following the shooting, students turned their grief into activism. Demanding change, pledging to never again let this happen again. Over the past month I have been following these students, getting to know them. These students have been meeting at their homes and planning. They traveled to Tallahassee a week after the shooting, meeting with state lawmakers. They demanded a change and got it. On March 9, Gov. Rick Scott signed the Marjory Stoneman Douglas Public Safety Act, a gun/school safety piece of legislation. However, these kids are not even close to being finished. 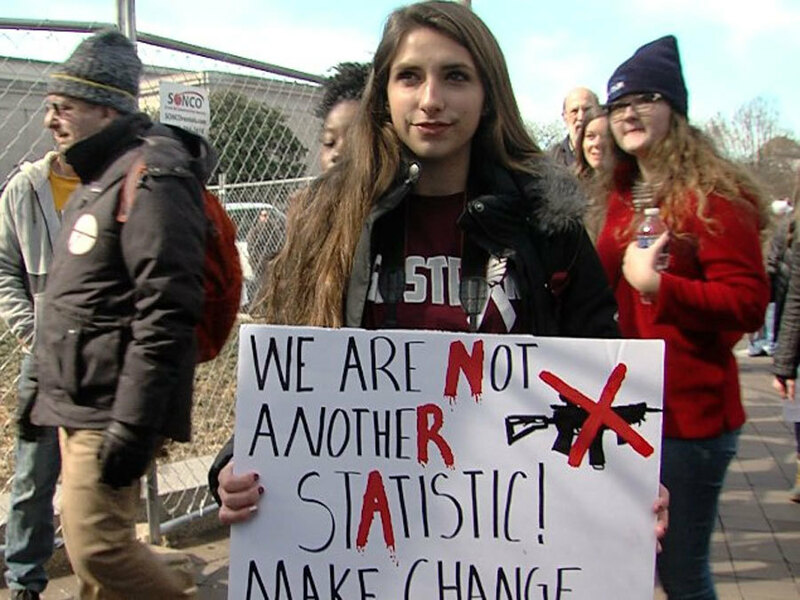 This weekend the movement continues with the March For Our Lives in Washington, D.C.
Thousands of kids, parents, teachers will march on Pennsylvania Avenue on Saturday demanding change. I will be there as I continue to follow these students. You can follow this blog as I will constantly update the latest happenings with the march as I speak with students and follow the movement.